Āyurveda is a holistic medicinal system and an organic approach to personal health. In contemporary times, Āyurveda is seen as an alternative medicine system with no supporting evidence of it's efficacy, when in fact, it is a complex science based in very precise principles. The diagnostic as well as treatment modalities are similar to other ancient systems including Siddha, Unani, Traditional Chinese Medicine, Kampo (Traditional Japanese Medicine) and Traditional Thai Medicine. For example, taking the pulse at the wrist, an Āyurvedic doctor can determine the balance/imbalance of prāṇa, hormones, and organ systems. Detailed and precise knowledge of the human body is vital to the mastery of Yoga. Only with the knowledge of Āyurveda (or traditional medicine systems), can Yoga be understood as an organic life science. Without this understanding, one will approach Yoga as an exercise program developing flexibility and strength rather than focusing on wholesome integration. The integration of Āyurveda, Yoga and Tantra provides an organic and wholesome life culture. These precise sciences can be understood by attentively studying the Vedas. The unfortunate, fragmented outlook (see Dr. Fritjof Capra,Tao of Physics, Turning Point) that has become our current worldview can be overcome with the study and application of the Vedic science. Vedism is in fact an ancient science that belongs to all humanity, as fossils and linguistic traces reveal (see Divine Initiation). The Vedic science encompasses the study of Āyurveda, Yoga, Tantra, and Āgamas. According to the Vedic outlook, an organic, wholesome life experience naturally involves us with Spirituality. The straying away from Spirituality causes a dichotomized mind state (mind and matter) that manifests as a limited experience of life and therefore makes us objectify people and the environment. With this worldview, our expression of life is restricted. The embracing of a Spiritual science remedies this deviation from true humanity. Spirituality therefore allows us to experience life wholly. This centering also allows us to develop our potential as human beings and shift our perspectives in order to truly live. Spiritual centering redefines our value base that, if left undefined, can manifest as psychological uncertainties. Buddhism is a profound ideology. However for the last few centuries it has been enshrouded in inaccuracy. These inaccuracies linger on from the misreadings of past colonial scholarship. Unfortunately, even today due to the nature of institutional education [mentorship etc.] this extreme reliance on the past scholarship is preventing the correct perspective in the study of this profound ideology. A look at the textual description by the Buddhist text on the topic on Patimokkha and Garudhamma will reveal the shortcomings in the understanding of contemporary scholarship on these topics [both orthodoxy and Orientology]. Their simplistic interpretations are not true to Buddhism. In the Patimokkha and the Garudhamma the topic is not social or political as these institutions believe. By interpreting the Patimokkha and the Garudhamma as rules governing sexual misconducts etc. as laid down by "the Buddha" one reduces the Patimokkha and Garudhamma to regulations and control by a male misogynist, thereby diverting from the profound metaphysics the ancient texts offer. These simplistic misreadings abound in the entirety of not only Eastern Spiritual ideologies but also Western Spiritualism. We of the contemporary culture have unwittingly maligned our forefathers due to our ignorance. Feminism unfortunately merely capitalizes on these misinterpretations to exploit for their political advantage. Buddhism is apparently a science outside the fold of the Veda. However, to the Vedists, Buddhism is only another reconciliation of the Vedic philosophy (seeThird Eye of the Buddhist). The Veda is the oldest extant scripture on philosophical science that is not preclusive to any one race or political group but rather is the legacy of humankind (see Divine Initiation). It is due to this single reason that many cultures have the Buddha presented with the Vedic metaphysical entities as Shiva, Vishnu, Indra, and Brahma. Traditionally, Buddhism is understood as representing another aspect of Vedism, especially Shaivism. It is only in the last few centuries, with the advent of Orientology (Buddhology and Indology), that the world has come to believe that Buddhism and Vedism are non-congruent sciences. In cultures that are devoid of the limitations of Orientology, one can see the integrated nature of these sciences. In Nepal, one can see not only the existence of temples that are either Buddhist or Shaivite, but also an integrated Buddhist-Shaivite culture. This is also true of the ancient cultures of Java, Burma, Thailand, and even Tibet. Even today, one can witness integrated notions of Buddhism and Shaivism in Cambodia, Java, Bali, and Nepal. These are living examples of a syncretic culture. The unity of Shaivism and Buddhism as a single science can also be seen in Tibetan texts, as in the historical accounts presented by Bu-ston and Taranatha. In important Buddhist Tantric texts such as the Hevajra Tantra, probably amongst the oldest remnant Tantric texts and a authentic Buddhist text, one can witness accounts of Divinities or Metaphysical Entities that are of Indic character, such as Mahadeva and Chandi (see Hevajra Tantra, tr. Snellgrove, D. L). In India, Buddha is understood to be a sage within the fold of the Vedic culture. In China and Japan too, Buddhism is integrated within the Taoist culture. In these cultures, the Buddha is understood to be a Metaphysical entity and not just a wandering Indian Sage as Orientology likes to paint (see Third Eye of the Buddhist and a chapter from this work on Bodhidharma on Buddhanet Ch'an-Zen-Bodhidharma). In India, the Goddess Sita and God Rāma have long been considered the ideal role models of husband and wife. This is despite the fact that Sita and Rāma are clearly metaphysical presentations. Though they represent specific principles (tattvas) of creation, they have nevertheless been interpreted literally over generations both in the East and West. Whole studies have sprung up discussing the ideal couple just in gender terms alone. According to the literal reading, in Sita we have the ideal woman: her husband is god, friend and guru. Even when entering the fire (agni pariksha) to prove her chastity to Rāma after her return from Lanka where she was held by the Demon Ravana, Sita portrays the ideal women by bearing Rāma's cruelty silently. According to the actual interpretation, which is unknown, this narrative explains the manifestation of Puruṣa and Prakṛti. Sita entering into flames denotes that Prakṛti (rudimentary manifestation of matter) in the Ramayana is Agni. Therefore, Sita returns to Agni at the end of the world cycle. Rāma is known as Maryada Purushottam or the limited Puruṣa, Being, or Spirit and is like Jesus Christ in Christianity. Orientologists, feminists and anthropologists (both within and outside India) certainly portray these models in patriarchal terms within Indic society. This perpetuates the false interpretation that men must be regarded as gods by their wives no matter what the texts present (i.e. burning by fire). However, we question this interpretation of patriarchal readings in Hinduism, as India was colonized from about 1680-1947. To understand the milieu of Hinduism, we can quote Karl Marx in the New-York Herald Tribune 1853: "All the civil wars, invasions, revolutions, conquests, famines, strangely complex, rapid, and destructive as the successive action in Hindostan may appear, did not go deeper than its surface. England has broken down the entire framework of Indian society, without any symptoms of reconstitution yet appearing. This loss of his old world, with no gain of a new one, imparts a particular kind of melancholy to the present misery of the Hindoo, and separates Hindostan, ruled by Britain, from all its ancient traditions, and from the whole of its past history." We question whether it is Hinduism, colonialism, or capitalism that creates this sexist-macho culture where men are perceived as dominant and women as submissive? We can't just assume that it is Hinduism that defines gender roles. Regarding feminist writers of scholarly works regarding this topic, it is important to ask: What portions of texts do scholars choose to interpret? What frames of reference do they use in their interpretation? How much power do they have to disseminate their interpretations? 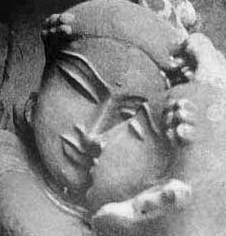 The God Rāma and Goddess Sita are symbols for the creative principle. Thus Rāma represents an aspect of the Puruṣa and Sita represents Rāma's other half that is Consciousness that manifests as sonancy or Divine Sound that becomes sentiency. Thus when Sita is banished from Ayodhya by Rāma to the forest at the end of Valmiki's Ramayana, she is swallowed by Mother Earth from whence she came from the furrow. Due to this, Sita is not born from the ethereal realm or the Yoni according to the Ramayana and the Veda. The ordeal this couple faces depicts that Rāma as the Puruṣa will survive the Solar Dissolution but Sita as sentiency is affected. This is depicted as the demon Rāvaṇa capturing Sita and imprisoning her on his islet. We can cite a passage from the Padma Purana (VI. 270. 29-31 quoted in 'Divine Initiation' p. 83) to portray this meaning more clearly: "Janaki or Sita is the mother. Raghava or Rama is the father. I revere her the Manifest, him the Unmanifest. I revere her as Contemplation, him as Object of Contemplation. Offerings are made to the Evolved (Sita) and to the Non-Evolved (Rama), to Sita the Essence and to Rama the Changeless. As Lakshmi is to Vishnu, so Sita is to Rama. Sita is as Gauri is to Shiva." The predominant correlation of the goddess with Indian women in the Vedic tradition is with the goddess Shri-Lakshmi, who is both auspicious and abundant. This is symbolized by the lighting of lamps in Hindu homes. Also in the marriage ceremony, it is often the goddess Laskhmi (but it depends on the tradition) that the bride symbolizes. Her husband also symbolizes the Divine. Thus, both are invested with tilaks and many other auspicious adornments such as jewellery in accordance with a Monist reading of the Dharmaśāstra. The marriage is regarded as a marriage of two souls in the light of two Divine Beings, as this accords with the Hindu idea of life to be lived to the maximum potential or dharma. The Hindus, to consecrate their marriage, walk seven times around the homa fire. The homa fire is the core energy that is the grace of the Divine that manifests as Creation for our benefit. The Hindus use this light or fire or Agni as their witness to live a fulfilled life and honor their partner in life's journey. In Tantric culture, a virgin girl is worshipped as the deity in the Kumari puja (in Nepalese culture and northern and eastern India). All over India, girls are worshipped as Shakti during Durga Puja. In Assam, until recently, the entire left-hand worship (vama marga) of the Divine Goddess was practiced. In much of India, especially Bengal, women are seen as forms of the Divine Mother known as Kali Ma. In much of village society too, Mata is the term for the goddess and many women are worshipped as Mata. Children in India address their mothers as goddess or Mata/Mataji. Even Mother Mary is worshipped by Hindus. The high status of the Divine Mother is reflected in the high status of motherhood in all of India. But of course women are not limited to motherhood as India has had Indira Gandhi as prime minister and until today Sonia Gandhi is the defacto head of the Congress party. In Tamil culture, Mariamman is not a small-pox goddess as Orientology misreads. Her meaning is as described in the Tamil Agamas or Peria Puranam or Grand Purana, the grand Goddess. She is merely worshipped for grace to avert the viral attack that causes small pox. Ultimately, the correct interpretation of Manu's Dharmaśāstra (another text jargonically presented) leads to the correct understanding of how women are regarded in India. They were to be protected by their fathers, husbands and sons. This has been exploited by dysfunctional males to maintain gender hierarchies. Is Hinduism at fault or the changing times? Manu states that from women manifests the family, society, state, and civilization. Therefore to Manu, women are the veritable goddesses on this earth. This is the value of women in Indic culture. Therefore, a woman is Lakshmi, she is Sita, and she is Devi. David Kingsley in his work, 'Hindu Goddesses: Visions of the Divine Feminine in the Hindu Religious Tradition', confused a female's political reality with an abstract presentation of metaphysics. This confusion is carried on in Feminism, goddess and other studies on Hinduism, in particular, Religious Studies. The Veda forms the core doctrine of Indic Spiritualism. The Veda is an ancient legacy shared by humankind [see Divine Initiation]. It is still the earliest existing text of Spiritualism. The Veda, Tao, Torah, Testament, Koran etc. belong to all humanity. Knowing this, India has always had a plurality of religious cultures. The word Veda refers to the ideology that we see with our third eye. Vid means to see. To see is to have darshan or view of the Divine. It can also mean that we have a legitimate perspective of philosophy. The Latin word Vid: to see, originates from the Sanskrit word Veda. The English language like many other European languages can trace its ancestry to Sanskrit. Due to this, they are clumped together as the Indo - European languages. Indeed, the Vedic history [including Greek and Chinese philosophies] is the earliest history of humankind. The Veda is the oldest Spiritual literature we have. The Vedas are based on the monist [advaita] ideology [cf. Divine Initiation]. Advaita or monism defines that there is nothing else than the Divine God. In Vedism and its derivative ideologies i.e. Agamism, Tantricism etc. there is the belief that anything aside from Advaita or monism can never be philosophically or mathematically correct. In traditional Indic perspectives even Buddhism is another Agama. Therefore Buddhism is known as the Bauddha Agama. Friedrich Max Muller, a colonial Orientologist, embarked on the study of comparative religion and hastily misread the Veda to accord with his ideas of the evolutionary principles of social Darwinism. Since then, Orientologists have been writing on how the Veda is the original example of proto or primitive religion. This is false has been proven by the monographs Divine Initiation and Third Eye of the Buddhist . The word Veda denotes sacred knowledge. The Veda is also known as Shruti or the Amnaya. The word Shruti means "heard" or "revealed." The word Amnaya approximately means "that which has come down as tradition." The Vedas are traditionally understood as "Apaurusheya." The word Apuarasheya has been wrongly translated as super - human. Apaurusheya simply means "before the notion of Purusha ie. Creation" and therefore refers to the doctrine of Brahman. The word Brahman comes from the root Brh. In Sanskrit this root simply means "to ever grow". In other words, it denotes infinity - the idea of infinity as the substratum of all. The Veda holds that the infinite or Absolute is the basis of Creation. This absolute is God in other religion. This term Brahman itself should explain to academic scholarship that the Veda is a monist or advaita science. The Veda is not written in a simple, thematic form. It has left the theme to be read as per the allowed or philosophically valid interpretations. It is therefore the most important Indic literature. It is difficult to read the meaning of the Vedic hymns due to the athematic structure. It is even more difficult for a novice in Sanskrit. This is a basic reason why scholarship is still dependant on Max Muller. It simply does not have the expertise to read higher Sanskrit. This is unfortunate as we have entered a new millennium and Orientologists are left behind. Is Yoga a science? The traditional system of Yoga is indeed a science. Since the last few centuries, with the advent of the contemporary notion of science, the culture and habits of human beings have changed. In its beginning stages, contemporary science did not acknowledge the ancient understanding of science. This was because the ancient civilizations were not technologically adept. Since the ancient civilizations were technologically unsophisticated, they were disregarded by the advocates of modern science. Due to this, Yoga, Tai-chi and other ancient philosophies and practices were ignored until the demand for health routines rekindled an interest in these sciences, both in the West and in the East. However as science matured, and as it developed (from Cartesian notions to Quantum Physics), it still could not accept the ancient notion of science that appeared crude due to its holistic nature, as holistic meant the embracing of organic notions. In this process, the science of Yoga was modified to suit the changing technology-oriented world. At this time, many varieties of Yoga were born. In the late nineteenth century, many Yoga schools mirrored the demands of the then Western culture. The nineteenth century person searching for supplementary religious practices found occultism in Yoga (as can be seen in the philosophies of Annie Besant, the founder of the Theosophical society, C.W. Leadbetter, and the Mother, Mirra Alfassa, of the Shri Aurobindo Ashram). The change in the West from miracle-orientated ideologies to science saw Yoga affording a vision of liberalism. This then became a sought after ingredient and Yoga ashrams that facilitated this aspect were prevalent. Then Yogis were associated with hippies. After this brief spell, demands on health become the focus and many specialized forms of Yoga swamped the market. Some merely focused on the cardiovascular aspect of Yoga, some on the weight-watchers aspect, some on muscle-toning systems, and yet others offered Yoga as an antidote to sedentary habits. In the process, the original interpretation and practices of Yoga became almost extinct. Teachers in India who emphasized on an organic, wholesome system lacked support and vanished into oblivion. However, with the inroads made by modern science, we now understand that the ancient sciences of Yoga and Tai-chi were in the first place based on a notion of science that was advanced. Indeed, these ancient traditions anticipated what we today understand as science (see Tao of Physics and Turning Point; Dr. Fritjof Capra). The holistic sciences, as Yoga and Tai-chi, are by their very nature drawn from principles analogous to modern science. This Yoga Ashram endeavors to preserve and perpetuate this holistic, organic Yoga. The name for this holistic system of Yoga is Shaiva Yoga Vijnana. This is to distinguish this system of Yoga from the Yoga systems of other schools. The unadulterated, ancient science of Yoga, in its pristine form, happens to embrace this holistic, organic notion of Yoga. Shaiva Yoga Vijnana is this pristine system. It teaches not only the Yogic postures known as asanas, but also the Yogic principles of pranayama and dhyana from a holistic perspective. The holistic principles of the science define that the practices and philosophy embrace an organic notion.